Running and stress fractures of the foot are an increasingly common combination. These hairline bone breaks are an especially serious risk for first-time marathoners. The repetitive impacts of running and constant mileage increases can be a dangerous combination. For this reason, foot pain should not be ignored. Lack of experience and conditioning can contribute to the risk of developing stress fractures of the foot. But other factors can contribute as well. Wearing improper or ill-fitting shoes while running can be very damaging, even for experienced runners. Those suffering from flatfoot, other foot deformities, or osteoporosis can also find themselves at higher risk. Any of these risk factors combined with rapid increases in running mileage during marathon training can quickly lead to the sidelining of a runner. As a general rule of thumb, runners should not add mileage from week to week by more than 10%. Gradual increases of training intensity are one of the best ways for runners to avoid stress fractures. Dr. Pereira also encourages runners to consider adequate rest time between runs. It is during rest that the body is able to heal. Starting another run when the feet and legs are still overly fatigued from the last one is a recipe for injury. All runners should watch for signs of stress fractures, even if they’ve been cautious about reducing their risk. Pain, swelling, redness, or bruising on the feet can each indicate a stress fracture. Stress fractures begin as tiny cracks but can develop into a complete break of the bone if left untreated. Paying attention to the early signs is crucial to getting back to running as soon as possible. Never assume that the symptoms above will simply get better on their own—and never be tempted to push through the pain. If a stress fracture is suspected, you’ll want to immediately follow the RICE protocol—Rest, Ice, Compression, and Elevation. 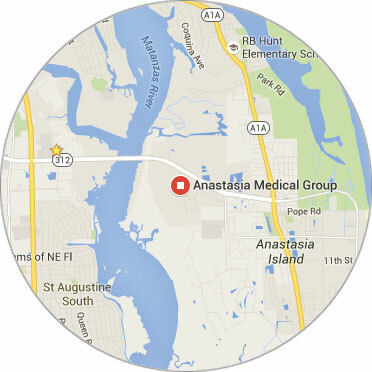 Ask your doctor or call Anastasia Medical Group to discuss your symptoms and determine if an x-ray and diagnosis should be considered. Treatment for stress fractures varies, but generally includes rest and immobilization with a cast. It’s possible that surgery will be recommended, but this varies from case to case. Catching the injury early can greatly reduce the time and intensity of the treatment regimen. Avoiding stress fractures in the first place is always preferable. This type of injury doesn’t have to be a rite of passage for any runner, so remember to think about prevention whenever considering either taking up running or increasing your mileage. First, wear the right shoes. Properly fitting and supportive running shoes are a must for any runner, especially for those logging the majority of their miles on hard sidewalks and pavement. Second, remember to increase mileage gradually from week to week. When planning to train for a long race like a marathon, be sure to give yourself plenty of time to build up your mileage for race day. If you have foot conditions or prior injuries that may increase your risk for stress fractures of the foot, speak with Dr. Pereira about how to get the most from your running while minimizing the chance you’ll be sidelined by injury.